Our qualified service technicians are committed to providing you with fast and reliable call out service, we’re experienced in all manner of roller shutters & roller door repairs, whether it’s in warehouses, factories, garages, and manufacturing facilities. We have the skills and the equipment to tackle the really big jobs. For any emergency repairs be it an industrial or commercial roller shutter, grilles or fire shutters, we offer fast, efficient service at affordable prices. Our fully equipped vehicles provide the ability to get to you in your areas, giving you the knowledge that no matter what the problem is with your roller shutter or door, such as truck or fork lift impact damage, door has come off its rollers or the door has come out of its rails?No matter the problem or damage involved, we will secure your door to give you lock down for security of your premises and goods & giving you peace of mind. Once your premises have been secured, we can then get a quotation to repair your door in your hands within 1 business day depending on time of day damage accrued of course, same day if early, following your request to inspect or secure the opening.We can also organise all quotations for insurance purposes. If accepted, repairs can be completed within a timely manner, subject to the availability of parts; we are able to source & fix or get for you within a very fast process, replacement Ezi Roll slats, Mirage Slats, Monsoon Slats, Airport Slats, B&D slats, respring of roller shutter drum for you, the only thing that would draw out any replacement time? Would be if you required powder coating, we always keep our clients fully informed of what is required? How long it will take, the lead time, date ready and installed etc? & all costing is up front for your approval. Are your premises rented? We ring your tenant direct on your behalf, making a time that suits them to meet on site, whether it is for a service, repair or quote, if there should be any ongoing works/repairs requested, then we keep all parties informed, saving a lot of going back and forth for owners, rental agencies etc, we understand that your business, time & tenants are important and you all ask is to be informed and considered in what the steps are, we make appropriate times with all concerned making sure it fits in with your busy schedules. You as the customer are our number 1 priority, no matter how big or small the job is. We take immense pride in treating “every customer” & job with priority’ we give you the best service & workmanship available, with over twenty years of experience in this industry, we feel confident you will be totally satisfied with our friendly & efficient service. We provide scissor lifts for working safely at heights and have cranes in place for any serious lifting, if needed. All our service technicians are highly trained and carry all safety cards for equipment use. Blue cards etc, they also have been police history checked for peace of mind of our elderly Clients. Our electrician is fully qualified and holds a Queensland Electrical Contractors Licence, so you can be assured that he will get your job completed to the highest standard required in industrial situations. With plenty of electrical experience, emphasis is placed on quality of work as well as safety. Emergency call out services for overnight Lockup. Repair and or replacement of worn or damaged rollers, curtains, slats, bottom rails and guide tracks, springs. Motorisation of Hand or Chain Operated Doors & Shutters. Re-spring of Damaged Roller shutter Drums (Ezi-Roll – Austral – Air port and many more. Secure blown in roller shutter or roller door from storm damage. Factory door not closing? Warehouse door jamming? Time to give us a call – We attend Repair, and if need be? Quote! Door has come off its roller or out of its rails, Stuck or impacted roller doors & shutters , Drums ,broken springs, doors that are out of its tracks, damaged & impacted curtains, damaged slats, damaged bottom rails, doors off track, doors ballooned out, doors hard to lift, you just need it closed, chain keeps slipping, door keeps stopping, motor is noisy, replacement Ezi Roll slats, Mirage Slats, Monsoon Slats, Airport Slats, B&D slats, respring of roller shutter drum for you, or maybe it’s just not working to your satisfaction? Call us and we can help no matter what the brand or the size of door you have. Direct Door Services have extensive knowledge of ALL major Garage door brands, and Garage Door Openers including Ezi Roll, Mirage, Airport, Grifco, GFA, Merlin, Boss, Steel- line, Gliderol, Centurion, ARD, & many more, we fix and or replace all brands of all Doors slats, bottom rails, guides & 240v & 3 phase motors. We provide complete services and repairs of residential, industrial and commercial roller shutters and roller grilles anywhere in Brisbane, Gold Coast, Sunshine Coast, Toowoomba and the outer Brisbane areas. 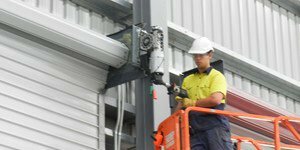 We offer industrial roller shutter repairs from Brisbane up to the Sunshine coast, Gold coast, Toowoomba, Ipswich, and all the outer Brisbane areas. Most problems that occur with Roller Shutters are simply due to a lack of regular maintenance. Depending on the usage of the door, some doors only require a service every 12 or 6 months. Other doors every 3 months and where the doors go up and down constantly, once a month (eg. car park doors). Regular preventative maintenance, servicing and lubrication will maintain the overall operating performance and safety of the shutter, but you must remember this is a moving mechanical mechanism with moving parts, and just like you service your car to keep it running smoothly, so should you service your doors, it is well worth the up keep cost to the broken cost. We can identify any curtain alignment, spring tension requirement, spring replacement or worn parts before any serious and costly problems occur. A maintenance agreement is available on all industrial and commercial roller shuttersAs part of our preventative maintenance program, we offer a free initial site inspection and comprehensive report on your Emergency Repairs. Once you are on our maintenance schedule, we give you a curtsy call & inform you when your doors are due for their regular services, you can then decide on appropriate day & time that suits best and we work in with that for your convenience. Garage door springs are responsible for lifting the weight of the garage door, either manually or using motorized opener. The steel garage door springs face enormous forces every time the door opens or closes. Over time, the steel weakens and eventually cracks or breaks due to wear and tear. How often you need to replace the springs? This depends on how much you use your roller door, roller shutter and the care given from regular servicing. For information on Brisbane Direct Door Services, please phone us on (07) 3802 2999 or email info@directdoors.com.au. For information on Insurance Work, click here.